storage system for smaller PV systems, multifunctional with power management control. This system consists of a true sine wave battery inverter from Victron, a battery charger which features adaptive charge technology, and a high-speed AC transfer switch in a single compact enclosure. The Victron inverter has two AC outputs. of a grid failure or disconnection. This happens so fast (less than 20 milliseconds) that computers and other electronic equipment will continue to operate without disruption. 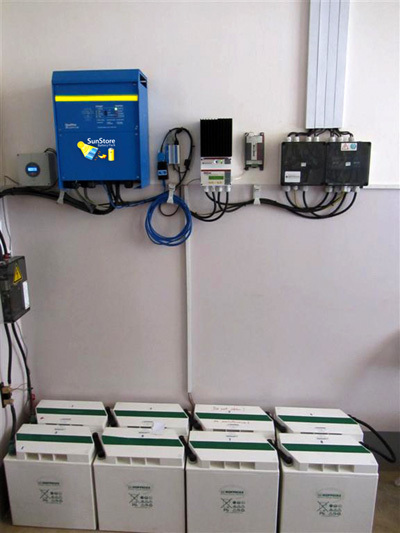 SunStore 9.6 kW is a modular battery storage system consisting of a 5kVA Victron inverter/charger and battery pack. This system is ideal for all PV systems up to a size of 3.36 kWp. SunStore is also available for larger systems and further details can be supplied on request. SunStore-2 is a modular battery storage system 9.6 kW consisting of an 8 kVA inverter/charger and battery pack. This system is ideal for all PV systems up to a size of 6 kWp. Price on request.